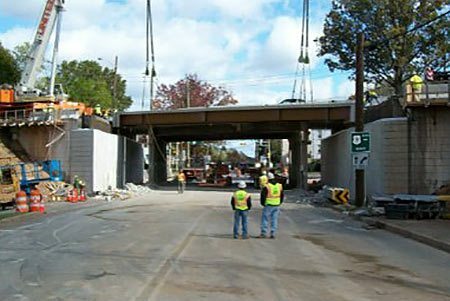 Taylor Wiseman & Taylor (TWT) provided complete Design Services for the replacement of the existing superstructure, and much of the substructure, of the Route 9 Bridge over Main Street (CR 514). The average traffic volumes on Route 9 exceed 50K vehicles per day. The Bridge, constructed in 1937, consisted of a concrete-encased steel beam main span, and two relatively short concrete slab approach spans, for an overall length of 83 feet. The original project Scope of Services called for replacement of the existing deteriorated bridge deck. 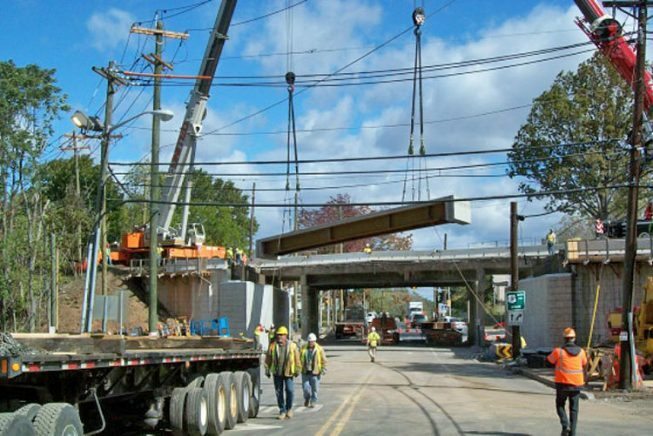 Due to the integral nature of the existing bridge deck and beam encasements, and the requirement to maintain two lanes of traffic in each direction on Route 9 during weekday daytime hours, TWT recommended that the entire superstructure be replaced using a pre-fabricated superstructure system. During Final Design, Woodbridge Township officials requested that the project design allow for the future widening of Main Street by one lane, which given the location of the existing shoulder piers, was not possible. TWT developed an innovative approach to satisfy all project constraints, consisting of constructing new abutments immediately in front of the existing abutments without impacting Route 9 traffic, replacing the existing 3-span superstructure with a single span prefabricated steel beam-deck unit superstructure thereby eliminating the need for the existing shoulder piers, and limiting impact to Route 9 to the originally proposed 2-3 weekends. The existing southbound superstructure and piers were removed and new superstructure units set in place during the first weekend work period, with the northbound replacement performed on the following weekend. The staging allowed one lane of Route 9 in each direction to be maintained during the weekend work periods through the use of median crossovers. The project was successfully completed within the specified time constraints. Design services included field survey/mapping, digital scanning employed for the “As-Built” bridge survey; structural and roadway design; significant utility relocations; extensive traffic impact assessment; complete final construction contract documents; and construction services, which included site visits, and review of all shop and working drawings.